I’m co-chair of the Sustainovation Team on campus, a group of faculty and staff that work towards campus/community collaborations that involve sustainability and innovation. Our work is funded by a mini-grant by PepsiCo, distributed through the Penn State Sustainability Institute. 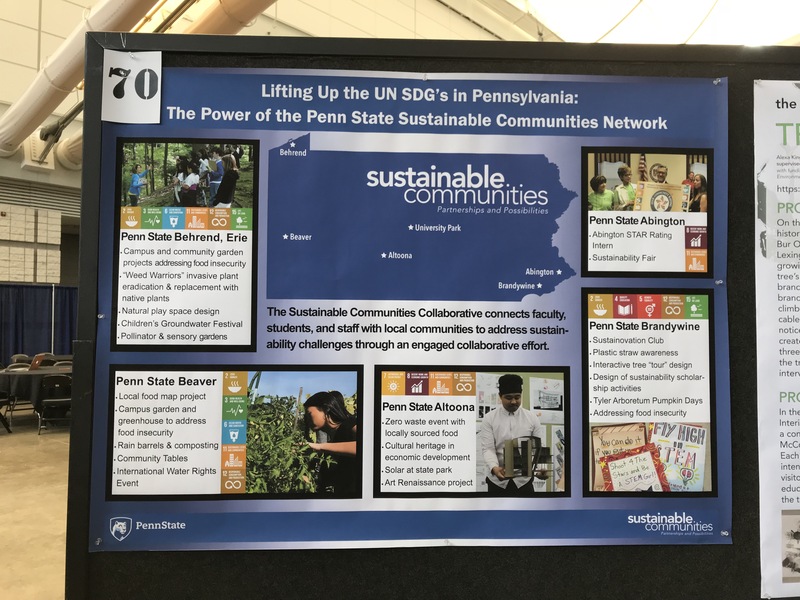 Penn State Brandywine is one of five campuses that were awarded the grant funding to participate in the Sustainable Community Collaborative (SCC) for three years. The 2018-2019 academic year is our second year of programming with our community partners. I co-chair the Team with Professor Karen Theveny in Communications. We have been collecting data for our grant work as part of our assessment of the impact of sustainability programming on our students. When the opportunity came up to present some of our early results at a conference in Pittsburgh, we jumped at the chance (first, submitting and getting abstracts accepted about our work). 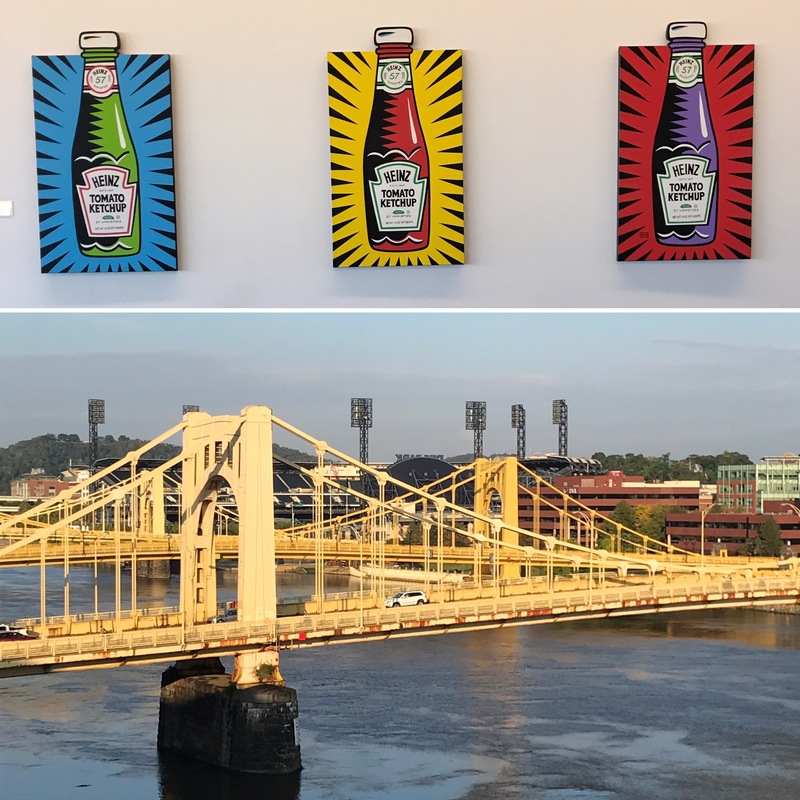 On October 2, Prof. Theveny and I headed off in our rental car to Pittsburgh for the Association for the 2018 Advancement of Sustainability in Higher Education’s (AASHE’s) annual conference, “the largest stage in North America to exchange effective models, policies, research, collaborations and transformative actions that advance sustainability in higher education and surrounding communities.” The land of Heinz ketchup and 446 bridges (more than Venice, Italy!) did not disappoint for their sustainability initiatives as a city, either, with the David L. Lawrence Convention Center having LEED Platinum status. 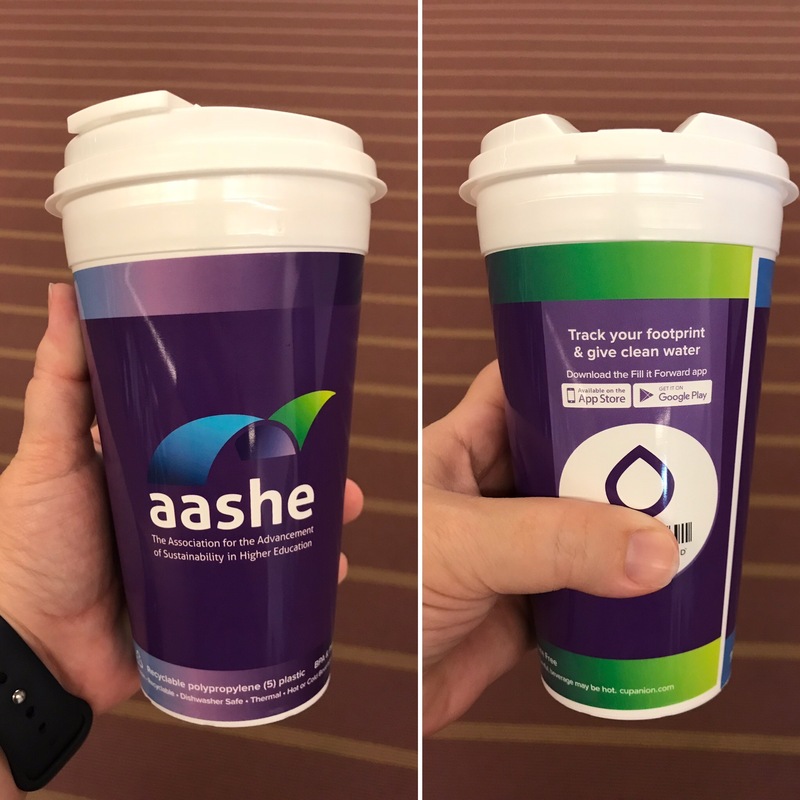 At registration, each of us received a reusable cup to fill at the water stations in the convention center during the conference. It is actually a “game” by Fill It Forward to get people to fill their water, scan the bar code, and be aware of how many plastic bottles we are saving from landfills. Prof. Theveny and I attended an opening keynote, several talks and posters, and then presented ourselves! I’ve included some tweets below that share some of the sessions I attended and what I learned. It was exciting to be able to present our work from looking at the impact of having a Sustainability Research Station at Tyler Arboretum’s Pumpkin Days, to hosting our campus’ first-ever CanstructionU competition. We’re using a validated survey on attitudes and values towards sustainable development, and it is showing that our efforts are making a difference with students! We look forward to continuing with our programming and helping our community partners with their efforts. I know that when I go to conferences, students are always interested in the food I eat(!). So I don’t want to disappoint… and I have to say, I was surprised at the food options in the convention center. There was no junk food or soda machines to be found. 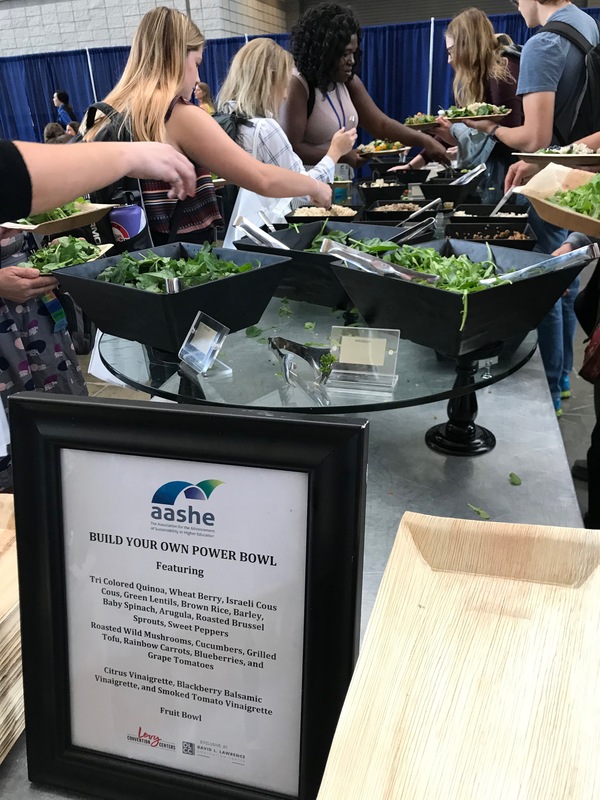 The lunch was provided at the conference, and it was a plant-based buffet, with many items locally sourced. This was a first for me to see at a conference! (We’re bringing this model of a plant-based food line back to campus, by the way – keep an eye out for it!) But I’ll admit that I am a carnivore, and when Prof. Theveny suggested we head to Primanti Bros. for dinner one night, I was all-in. We went to the original Primanti Bros., just down the road from our hotel. What a fun place – and an great sandwich! Check out these photos! One final conference highlight I’ll mention was something I saw in the Exhibit Hall. There is a carpeting company that makes carpet from old fishing nets collected in the waters off Indonesia. Local fishermen are employed to collect the nets and are educated about the impacts of empty nets left in the ocean ecosystem. 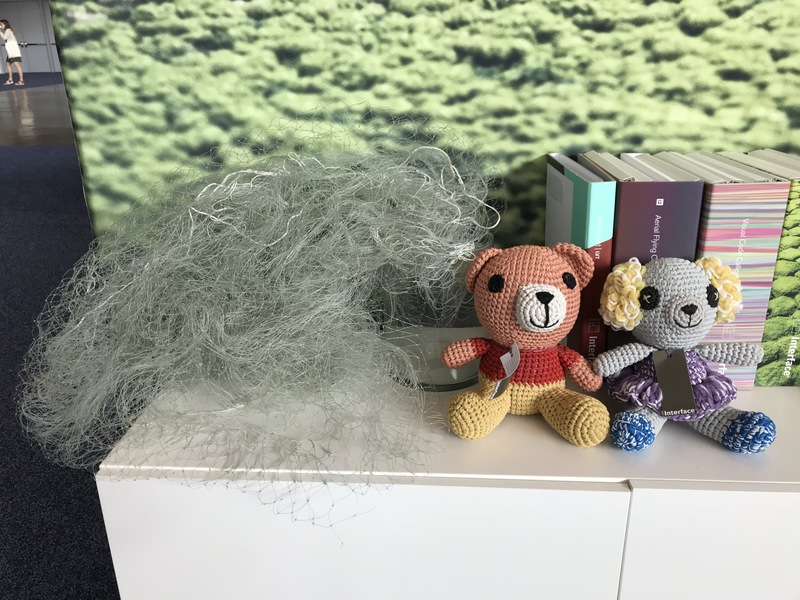 They are also using the discarded nets to make thread/yarn and making these adorable stuffed animals (a great educational tool to tell a story!). 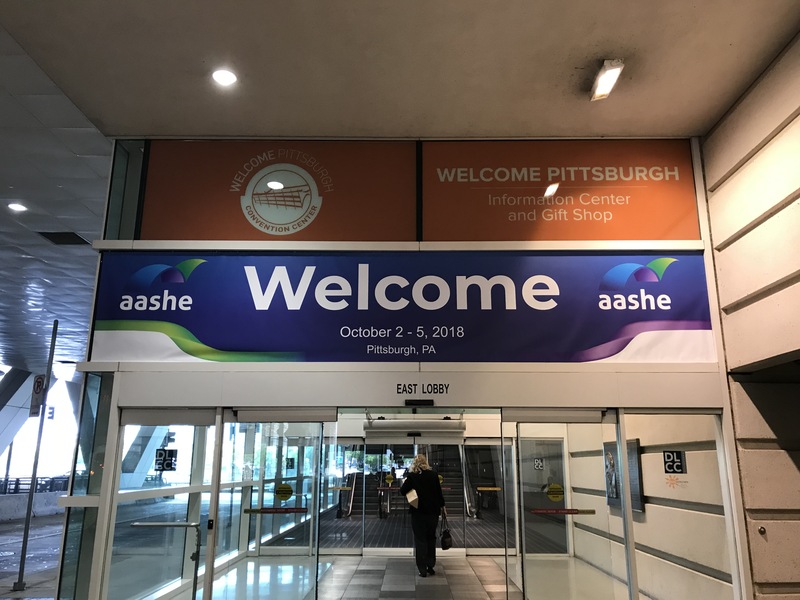 I learned so much at AASHE and had an excellent time with Prof. Theveny sharing our campus successes and learning new models and approaches to teaching and engaging with sustainability that we can bring back to campus. We will continue our efforts in the community and working towards the United Nations Sustainable Development Goals (SDGs)!